Apply modifiers appropriately to safely cross coding hurdles and avoid financial pitfalls. 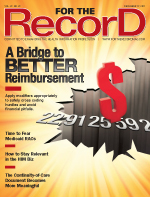 In today’s regulatory environment, no stone should be left unturned in the reimbursement equation. From lack of appropriate documentation to improper coding, there are many opportunities for claims to be rejected. According to experts, incorrect use of modifiers is a fairly common reason that claims are returned unpaid by payers. These simple two-character extensions of the CPT code can provide the final touches to the billing process and are a key element to the ability of a healthcare organization to receive proper payment for services rendered. CPT modifiers appear in three forms: two-digit numbers ranging from 21 to 99, two-character modifiers, or alphanumeric. According to Tina McDonald, coding coordinator at Carle, an Illinois-based network of healthcare services, a modifier adds to code descriptions by clarifying things such as special conditions of patient care, whether a procedure was repeated or performed multiple times, and if a service has been modified but not necessarily changed in definition. For instance, take the case of a patient receiving an arm x-ray. The CPT code would designate the procedure, while the modifier would reveal whether the x-ray was taken of the left or right arm. “It more clearly describes where the procedure was done,” Reeds says. According to McDonald, modifiers should be used “whenever it is applicable by definition of the CPT book.” Developed by the American Medical Association, CPT codes are numbers assigned to medical, surgical, and diagnostic services provided by a practitioner of a healthcare organization to drive uniformity for reimbursement by insurers. Within a hospital setting, CPT codes are used only on the outpatient side. Consider a procedure to place tubes in a child’s ears. The CPT code itself will represent the actual insertion, according to Reeds. The modifier explains whether the procedure was done in the left or right ear or both ears. Software applications will often provide alerts that a modifier may be required, but Reeds cautions that there has to be an oversight process in place to ensure a modifier is used correctly. For example, consider that HIM provides a surgical code for billing. Then radiology adds a code to the master charge. The codes meet in the billing office, and the bill is run through the editing process before going out. Often, the system will provide an alert that identifies the possible need for a modifier. More than one modifier may be required with a procedure code, and not all CPT modifiers are relevant to every category of the CPT codes. Some modifiers—such as 24, 25, and 27—are used only with a particular category. In this case, the modifiers are used with evaluation and management (E/M) procedures. According to Jennifer Swindle, RHIT, CCS-P, CPC, CPMA, CEMC, CFPC, CCP-P, senior consultant with Southwind, a division of the Advisory Board Company, the Centers for Medicare & Medicaid Services (CMS) does not frequently update modifiers, but if a rule is changed, coders are expected to know it. Reeds recalls that the last changes to the CPT modifiers came several years ago when 73 and 74 were added to the surgery codes. These codes address reimbursement in the event a surgery is cancelled. Specifically, modifier 73 represents cancellation before anesthesia and 74 represents cancellation after anesthesia. “With the addition of these modifiers, a hospital can now get reimbursed for prep time,” Reeds notes. While direct changes to modifiers may not occur on a frequent basis, Reeds adds that quarterly edits from the National Correct Coding Initiative (CCI) may impact how and when they are used. Besides changes from the CMS, coders need to stay abreast of the individual rules of various insurance carriers. “Not all carriers want [modifiers]. You have to know the needs of each carrier as well,” Swindle says. For example, modifier 50 is not recognized by all payers. Used when surgeries are performed bilaterally during the same operative session, CPT requires a one-time listing of the procedure code and the 50 modifier, while some carriers prefer a two-code listing. McDonald says no assumptions should be made about modifier use, and each situation should be evaluated independently to determine if a modifier is truly warranted. Most important, the decision should be made by a coding professional who clearly understands the parameters of modifier use. • 22, Unusual procedural service: When surgeries require more time than usual or are described by the procedure code, they can be billed with modifier 22 to compensate for extra work and time. Some examples of these circumstances may include increased risk of severe respiratory distress or excessive bleeding. Documentation to support the use of the modifier will often need to be submitted with the claim. Also, the additional time and work provided must be substantial to warrant use. For example, consider a case in which a physician is performing a complex surgery and encounters excessive bleeding. The exacerbated situation forces the operating team to spend an additional 60 minutes to complete the surgery. In this instance, modifier 22 may be appropriately used. However, the use of the modifier would be inappropriate for use with “reoperation” codes or in cases where the complication is a result of the surgeon’s choice of approach. • 25, Significant, separately identifiable E/M service by the same physician on the same day of the procedure or other therapeutic service: Here, patient care would be provided through a procedure and E/M by the same physician on the same day for minor surgical procedures. Billing may need to provide documentation that the patient’s condition required a significant, separately identifiable E/M service on that particular day in addition to the procedure or service identified by a CPT code. An example of appropriate use of this modifier may include a patient presenting with left knee pain. Upon evaluation, the physician orders an injection after deciding the patient could benefit from arthorocentesis. The 25 modifier could be used to bill for both the visit (E/M) and subsequent injection (procedure). • 59, Distinct procedural service: The physician may need to indicate that a procedure or a service was distinct or separate from other services performed on the same day. In these cases, there may be a different patient encounter or surgery, a different site, or a separate injury. For example, if an excision of a benign lesion is performed and later a separate procedure, such as drainage of an abscess, is conducted, the 59 modifier would be used to designate the second procedure. • 91, Repeat clinical diagnostic lab tests performed on same day to obtain subsequent reportable test values: When a procedure requires the same laboratory test to be administered more than once to obtain multiple test results, modifier 91 is used to explain the multiple labs. This modifier is not to be used when a test is rerun to confirm initial results. Lack of use, misuse, and overuse of modifiers all bring consequences. Being aware of some of the common pitfalls can save facilities time and money in the long run, according to Swindle. Offering an example that might occur in a physician’s office, Swindle references a patient presenting with sinusitis who receives treatment from an earwax removal tool. If an appropriate modifier is not included to detail the office visit and procedure, full reimbursement won’t be realized. The 59 modifier is appropriate when two procedures are performed at separate sites or during separate patient encounters on the same day of service. It cannot be used in connection with E/M services or radiation treatment management. Reeds mentions modifier 25 as another potential hazard for coders. Relevant to E/M visits, she notes that a good standard for determining the use of this modifier is when the documentation of a patient’s clinical record points to extra preoperative and/or postoperative work beyond what is usually performed. In these cases, the physician must determine if the E/M service is distinct from the surgical service. Modifier 91 can also be problematic if coders are not properly trained on its parameters. Intended to identify necessary repeated laboratory procedures performed on the same day, the modifier is not intended to be used to confirm initial results, to represent labs repeated due to problems encountered with specimens or equipment, or for any other reason when a normal, one-time lab test would typically be required. Understanding how to present modifiers can also negate the potential for claims being returned or rejected. In cases where more than one modifier is used, a functional modifier should be placed in the first field, followed by the information modifier. The functional modifier directly impacts payment. If the informational modifier is listed first, payers will typically suspend the claim for manual review, which slows down claim processing.